Verna Mae Thomas was born December 25, 1923 in Roy Washington to Tom and Ruth Bryd. She married Curtis Thomas February 11, 1941. She is preceded in death by two brothers Lawrence and Franklin Bryd, one sister Ruthie Crum, two children Curtis Thomas Jr, and Rodney Thomas, two grandchildren Tammy Medeiros and M'lissa Tuft, well as by her beloved husband of 54 years. She is survived by son Leonard Thomas, daughters Cindy Hensley and Carolyn Medeiros as well as 9 grandchildren, 13 great-grandchildren, and six great great grandchildren. Verna was a proud member of the Cowlitz Indian Tribe, a lifelong member of the Rebecca Lodge of Roy, WA and loved to quilt and cross-stich. 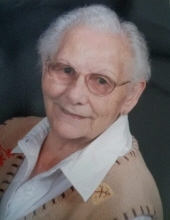 Verna enjoyed a long life of 94 years bringing joy to her family and friends. Verna loved to travel, play bingo, and bake. She passed away peacefully November 6, 2018 surrounded by the love of her family. To send flowers or a remembrance gift to the family of Verna M. Thomas, please visit our Tribute Store. "Email Address" would like to share the life celebration of Verna M. Thomas. Click on the "link" to go to share a favorite memory or leave a condolence message for the family.